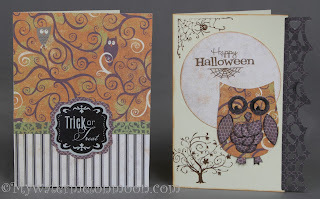 Welcome to the October Blog Hop featuring the Moonlight Paper Pack from Close to my Heart. I adore this paper pack! The owls are adorable and the stripes, I could just keep going, but you can take a look for yourself. If you came from Sheri Ann's blog, you are in the right place. If you have jumped here and just discovered our blog hop, feel free to check the list at Damask Divas blog to find the complete list of blog hop participants. Here is my project. I decided to make two cards. The first also features the Artiste cartridge! I used the spider web border and the cute owl. Whooooo loves owls??? ME! The sentiment is from the Spellbound Workshop on the go kit. I masked the border on it so I could put it on the moon. The other stamps are from a Halloween set I have had for awhile. I cut the spider web border from the Artiste cartridge, then trimmed off to size the front layer of the card, so the base of the card would peek through. Card #2 I simply chose to feature that totally adorable owl paper. You also see the cute striped paper. The stamped sentiment is from the Spellbound workshop on the go kit. The medallion it was stamped on was cut with Artiste. Right on the stamp set it tells you what size AND page to cute from Artiste on! How awesome is that? The next blog on the list is Ashley. 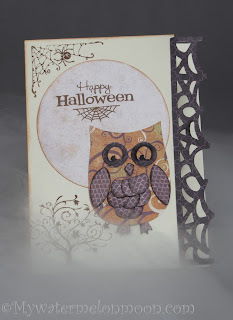 Hope you have a great time on our hop and checking out all the creations using the Moonlight Paper Pack. If you get lost, just hop on over to Damask Divas for the full list. So cute!! I love how you masked the boarder! So cute!! Love your little owl! Both are great cards! Great idea cutting the card away for the border! I really like how that pattern paper looks for the moon. Cute cards, Melissa! The cards look great. Good job! Found you from the linkup. Welcome! :) Heading over to you now! Love both cards. They are very cute!!! Beautiful cards. 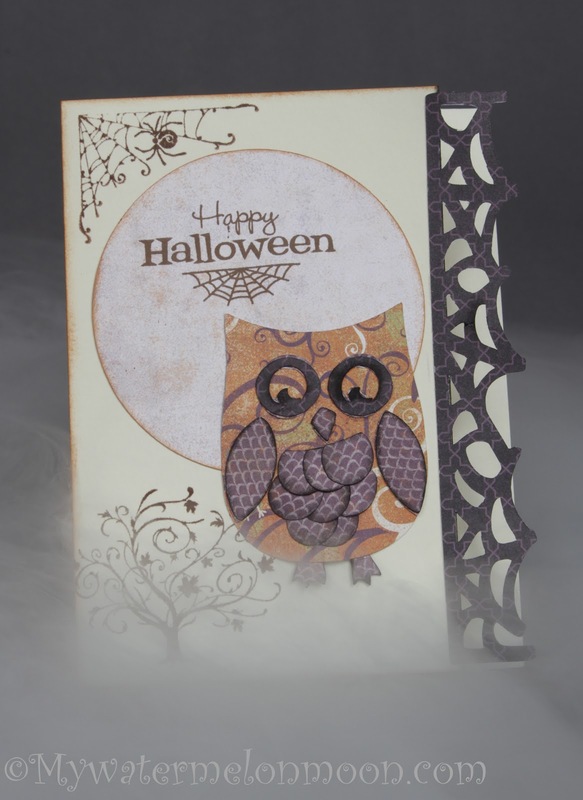 Lving the border on card 1 and what a cute OWl. Lovely paper on card 2. Cute cards! 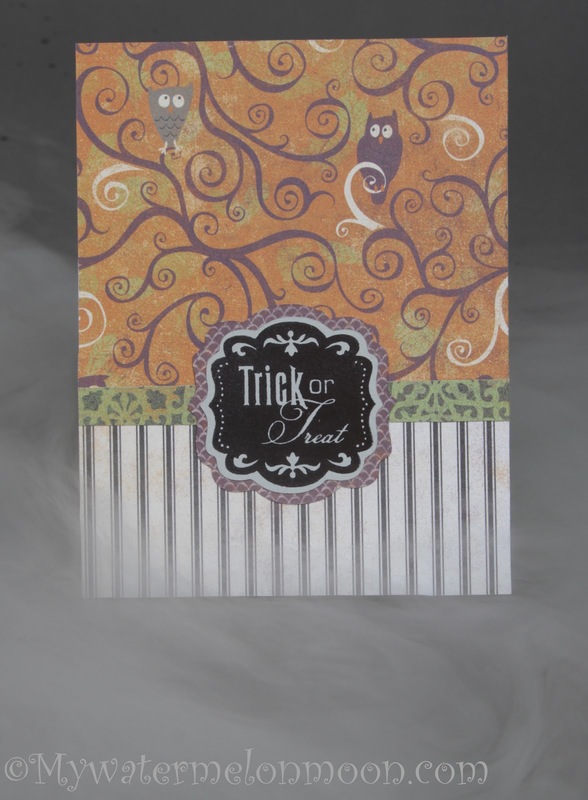 Love the spider web border and how you used the Spellbound Cricut Workshop stamps! Adorable cards Melissa!! Great creativity. Love them both. First, I adore your blog header and your tag line -- I'm a paper hoarder too! Love the colors you've used in your blog -- so bright and cheerful. 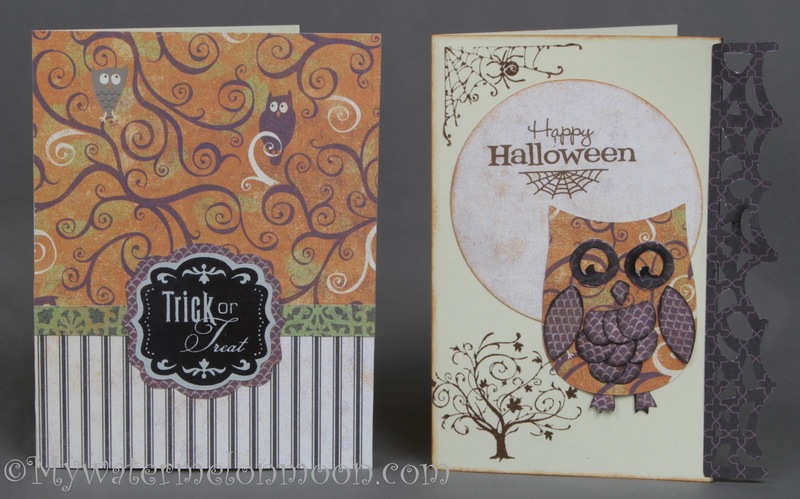 Darling cards -- Owls are all the rage and I seem to be missing that boat! I just love this paper (and your cards too)! Love the paper and the cute little owls too! The cards are wonderful and amazing presentation! Can not get enough owls! Awesome! Owl I can tell you is I love those birds!!! (Great cards, too!) TFS!